Illegal trade in wildlife is now recognized as one of the most significant criminal activities in the world, bringing billions of dollars in illicit profits to organized crime groups and networks, which are acknowledged to control much of this trafficking. Until 2011, John M. Sellar was the most senior law enforcement official operating transnationally to combat these activities, drawing upon his previous 24 years of experience in the Scottish Police Force investigating serious crime. Following his secondment as Chief of Enforcement to the Convention on International Trade in Endangered Species (CITES), he was labelled by the media as ‘The UN’s Lone Ranger’. His duties took him to more than 60 countries, involving 2 million kilometres of travel over the course of 14 years. His book describes why organized crime has turned to robbing nations, especially in the developing world, of their animals and plants and how this is bringing several species to the brink of extinction. It illustrates, in words and images, how criminal networks recruit, equip and direct poachers and wildlife contraband couriers; arrange the smuggling of species and products, often involving transportation across many borders and several continents; use bribery and violence against law enforcement personnel; and the nature of the markets in which illegal-origin wildlife is being consumed. Separate chapters examine particular wildlife crime-types, such as the poaching of elephants and rhinos, the hugely profitable illicit trade in caviar, and the demand for the skins and bones of tigers which has almost eradicated them. But Sellar, once described as ‘the world’s leading authority on wildlife crime’, also reflects frankly, and sometimes critically, on his service as a UN official, the way in which national law enforcement bodies are reacting to these crimes and the support provided by international agencies. He identifies what he believes are significant gaps in the current responses and suggests ways in which they might be plugged. He recounts several of his incredible experiences; visiting anti-poaching officers on the roof of the world, the Tibetan Plateau, and bizarre late-night hospitality from KGB officers. The UN’s Lone Ranger tells of law enforcement and diplomacy. It is also the first book, written from an international perspective, about a subject that warrants much greater attention, if the world’s most threatened species are to be safeguarded for future generations. It will be an engrossing and essential read for all who value the world’s wildlife and have a concern about wildlife conservation and preservation, eliminating abuse of and profiteering from the natural world. It will also be of huge appeal to wildlife professionals who have to implement and police conservation regulations and members/supporters of special interest groups and appeals for individual species. 'John Sellar tells a good tale. This readable book is a memoir by the Scottish policeman who went on to spend 14 years as 'the UN's Lone Ranger'... ...found himself in some astonishing situations in far-flung corners of the world... 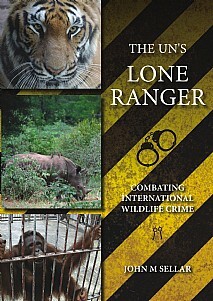 Anyone seeking a better understanding of how criminals are driving endangered species towards extinction should read this book... ...an entertaining read, if enforcement agencies were to act on the recommendations therein, far fewer poachers and smugglers would go unpunished, and far more endangered species might survive'. Reviewed for BBC Wildlife by Ian Redmond OBE; Ambassador, UNEP Convention on Migratory Species; Chairman, Ape Alliance.